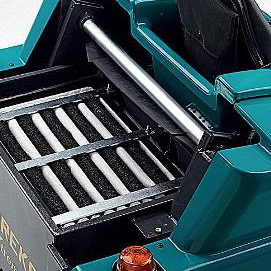 The Xtrema is an industrial floor sweeper designed and manufactured in Eureka. 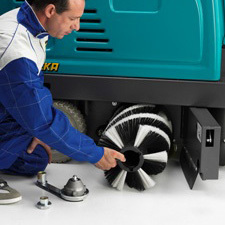 It features efficient hydraulically driven traction, lifting debris container, brushes and vacuum fan, which together enable it to sweep all surfaces rapidly and efficiently. WHY IS XTREMA SAFE TO USE & RELIABLE? 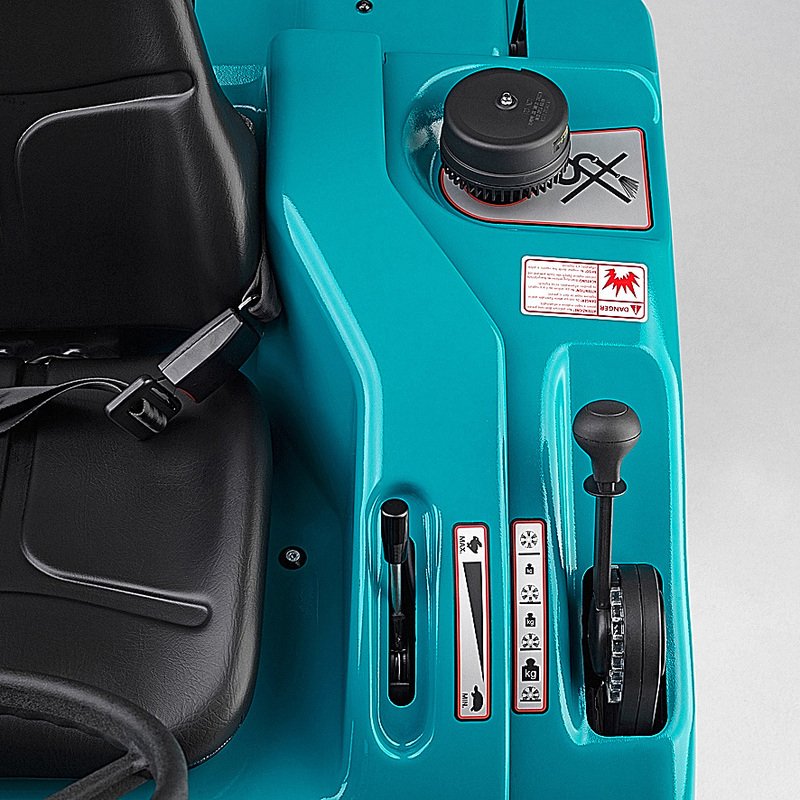 The Xtrema ride-on sweeper offers the standard Eureka S.p.A. security features such as: electric brake, mechanical parking brake, front and rear lights, reverse sound, claxon, warning light, anti-shock button. An even safer version is available, designed with overhead guard to protect the operator when sweeping between shelves. HOW EASY IS EMPTYING THE HOPPER? It's very easy! The operator from his position can easily control the multi-level-dump hopper. It can be raised up to 1.360 mm from the floor and has an impressive capacity of 150 litres. 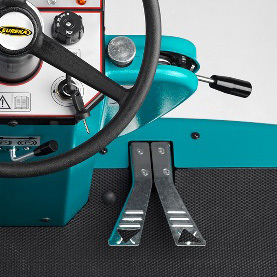 This boosts productivity and reduces downtime, enabling the Xtrema to rapidly sweep large surfaces without having to continuously stop and empty. WHY IS XTREMA EASY-TO-USE AND MANAGEABLE? 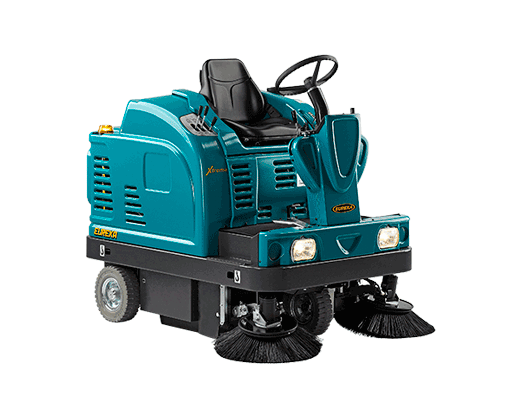 Xtrema is an extremely compact ride-on sweeper with great visibility and a small turning radius of 1.600 mm. These characteristics ensure Xtrema is manageable, suitable for congested or narrow areas and delivers on performance. HOW EASY IS CLEANING THE FILTER? Xtrema is equipped with a polyester bag filter, which differently from paper filters, ensures 99,9% fine dust retention. In addition it is completely washable and has a longer lasting life. A dust filter-shaker can be activated via the dashboard, providing highly efficient cleaning of the filter without the need for removal. In addition the Xtrema runs an automatic cleaning cycle after each sweeping session to ensure the filter is regularly cleaned, which is useful should the operator forget. MANEUVERABILITY: The Xtrema is a compact ride-on sweeper, with a small turning radius (1.600 mm) which makes it particularly suitable for sweeping in narrow, confined areas and can easily adapt to both industrial and commercial situations. POWER: The Xtrema is a 100% hydraulic sweeper able to climb even 20% gradients, while the powerful Kubota engine has efficient world-wide assistance. In addition the robust material, twin cylinders and liquid cooled system ensure high quality performance, and longer lasting life. COMPLETE DEBRIS PICK-UP: Eureka has designed an exclusive 3 section, integrated bristle brush in order to perfectly clean all kinds of surfaces. The main brush floats for better performance, automatically adjusting itself to the floor conditions. The multi-level-dump hopper located at the rear of the machine, is completely hydraulic and can be raised up to 1.360 mm from the floor, for easy emptying. The hopper has an impressive 150 litre capacity. The main brush can be rapidly replaced without tools. The dust filter can be replaced in a few seconds. All parts, motors, engines etc. 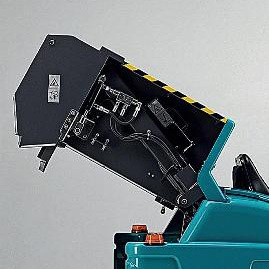 are easily accessible for servicing, as side, upper and rear panels can be fully opened. Xtrema is equipped with a polyester bag filter which is particularly efficient for the retention of fine dust, and has a much longer lasting life than other traditional filters. The shaker enables extreme cleaning of the filter without the need for removal. Strong hydraulic drive system, variable speed of up to 9 Km/h, controlled by two pedals (forward & reverse). Easy to use controls enable the operator to focus on sweeping, ensuring the job is done rapidly and efficiently. 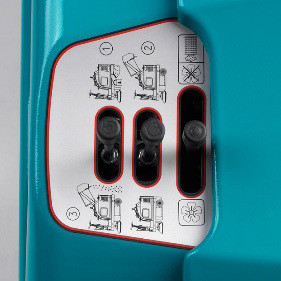 The operator can simply adjust the brush pressure while working via a precise control positioned on the dashboard.